Westchester ENT is an ENT (ear, nose and throat, also called otolaryngology-head & neck surgery) private practice offering quality specialty care to residents of Westchester county and its surroundings. Dr. Spingarn is an otolaryngologist – head and neck surgeon who brings a unique perspective to the diagnosis and treatment of routine problems as well as unusual, complicated, and difficult-to-treat disorders within the field of otolaryngology. His experience and insights can help solve even the most challenging problems. Every patient is seen personally by Dr. Spingarn, and given individual attention and state-of-the-art care. As a patient, you can expect a thorough assessment and treatment plan. If you have questions, we will do our best to give you answers. Our goal is to be your preferred choice for all of your ear, nose and throat needs. Dr. Spingarn is a New York native. As a child, he moved to northern California with his family. He attended college at the University of California in Berkeley, and then medical school at the University of Southern California in Los Angeles before returning to New York to practice medicine. He trained in general surgery at New York Hospital before specializing in Otolaryngology – Head & Neck Surgery at the Manhattan Eye, Ear & Throat Hospital. A practicing otolaryngologist in Westchester County since he finished training in 1995, Dr. Spingarn also lives in Westchester County with his wife and family. Dr. Spingarn is board-certified by the American Board of Otolaryngology, and is a fellow of the American Academy of Otolaryngology – Head & Neck Surgery. He is also a member of the Westchester County Medical Society. Dr. Spingarn’s hospital affiliations are St. John’s Riverside Hospital – Dobbs Ferry Pavilion (formerly known as Dobbs Ferry Community Hospital), White Plains Hospital Center in White Plains, NY, and Mount Sinai/Beth Israel Medical Center in Manhattan. Practice Philosophy: Not all doctors treat the same conditions in the same way. Many conditions that affect the head and neck require treatment with medication or surgery. If you suffer from such a condition, we will recommend the appropriate medication, corrective device, or surgical treatment. However, many other conditions affecting the head and neck either resolve on their own or cannot be improved with medication, a device, or surgery. An example is tinnitus, also known as ringing in the ears. Another example is the common cold. We do not routinely recommend antibiotics, for example, to treat a cold, which is a type of viral infection. If you have a viral infection and are hoping to receive a prescription for an antibiotic to cure it, you will probably be disappointed when we tell you we do not recommend an antibiotic. In cases of viral infections, our recommendations will focus on relieving your symptoms while waiting for your symptoms to resolve on their own. We have found that many of our patients experience side effects of medications that may have been prescribed with good intentions but were unnecessary. An example is treatment for dizziness, which often includes a prescription for medication that not only does not cure the problem, but can even make you feel worse. When your doctor prescribes medicine, ask if it is really necessary, and if the problem can be managed a different way, or even without medication at all. Physicians know that some patients expect to leave the office with a prescription. At Westchester ENT, we think that treatment with close observation, focusing on relief of symptoms, can be a better choice than unnecessary treatment. We also have found that, while surgery can benefit many different problems in the head and neck region, some surgeries recommended by other physicians are unnecessary. If you are looking for a second opinion regarding another physician’s surgical recommendation, we will be happy to let you know what we think. 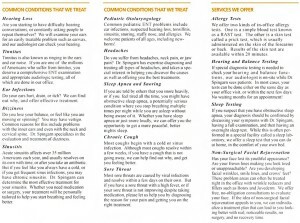 Below you will find some helpful information from our office brochure, which includes some of the conditions we treat and services we offer. For more information about our services, please click here. Dr. Spingarn is also the author of The Armonk Diet, a book that describes a new diet for losing weight. If you are interested in learning more, you may read more about The Armonk Diet here. A special note for our patients with Aetna health insurance. As of June, 2016, we are no longer in-network with Aetna insurance. This is due to Aetna lowering their reimbursement for our services. If you have Aetna insurance, Dr. Spingarn will be honored to take care of you. However, you need to decide if it is more important to see him as an in-network physician in a different location, or if you are willing to see him on an out-of-network basis in our Hartsdale office. To see Dr. Spingarn in-network, which may save you some money compared to out-of-network charges, you can see him in either his Bronx location (4238 Bronx Blvd, 718-325-9532) or his midtown Manhattan location (55 East 34th Street, 5th floor, 212-252-6005). In our Hartsdale office, Dr. Spingarn accepts Aetna’s out-of-network reimbursement as payment in full. But if you have out-of-network benefits, you may also have a deductible, which is an amount that you may have to pay out of your own pocket before your insurance pays. We can help you find out if you have a deductible. If your insurance only offers benefits for seeing in-network physicians, and you want to see Dr. Spingarn in our Hartsdale office, you will be seen as a private-pay patient, and you will be offered a reduced fee.